2018 will see exciting new tour-stops, some great comeback as well as events that became regulars and highly upgraded the European tour over the past years. The season will be openend at the Mondial du Vent in Leucate, France in the middle of April. 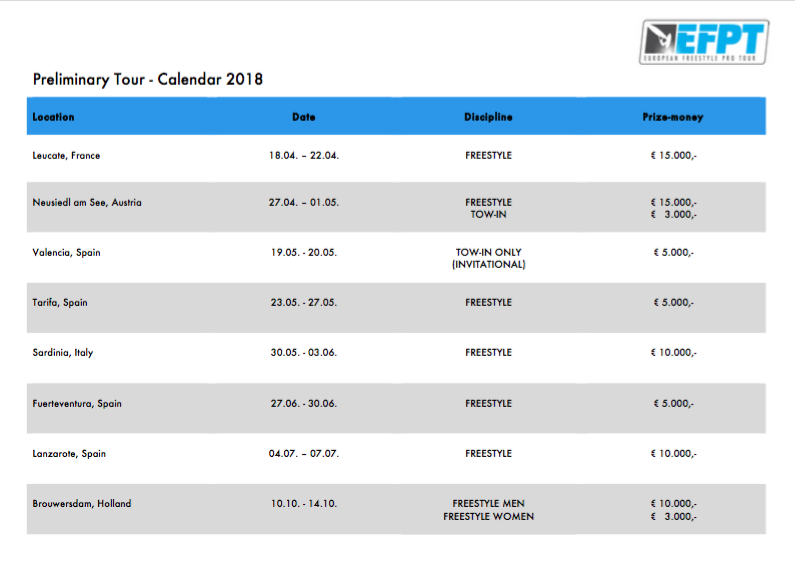 It has been a wish for many years for the local organisers and the team of the European Freestyle Pro Tour to bring the EFPT riders to this event. We are excited to kick off the year with a 5 star event and 15.000€ prize-money. Straight after France, the riders and crew will travel onwards to Austria, where the famous Surf Worldcup will be taking place in Neusiedl am See. The new venue in Austria was already introduced in 2017 with the IFCA Grand Prix format. This year the lake will be reserved for the best freestyle windsurfers only with a 15.000€ freestyle as well as a 3.000€ tow-in competition. The third stop this year will take the European Tour to Valencia, Spain where former EFPT competitor Rafael Cervero is running his windsurf and SUP center Ocean Republic. This event will be a tow-in only invitational event. Eight riders will be selected and will get the chance to battle for 5.000€ prize-money in the harbour of this beautiful Spanish town. For the fourth etappe we’ll stay in the country, but move further South to Tarifa, where the Toro Andaluz will happen end of May. The event was brought back to life in 2017 with a huge success: in perfectly flat water and gusting winds with up to 50 knots we have seen moves that have never been shown in freestyle competitions before. We can’t wait to see more of this action in 2018! After France, Austria and Spain, Italy will be hosting an event this year. We are delighted to be able to return to the shores of Sardinia after several years of break. Straight after the big freestyle show in Andalucia, the riders will have three days to make their way down to what is known to be one of the best windsurfing spots of Europe. The reliable conditions and the 10.000€ prize-money speak for themselves and will surely attract a big fleet and audience. In the beginning of the European summer a small ‚Canaries Tour‘ will be launched. Matas Blancas on Fuerteventura is another new addition to the EFPT circuit. Davide Zilli and the Windsurf Center Fuerteventura will stage a 5.000€ event at this offshore spot on the windy Canary Island. The conditions will remind of the ones in Tarifa and we’ll definitely see some real flat water madness there. Additionally to the pros, a junior competition will be run. In early July, Costa Teguise in Lanzarote will be the place to be for Europes freestyle elite. 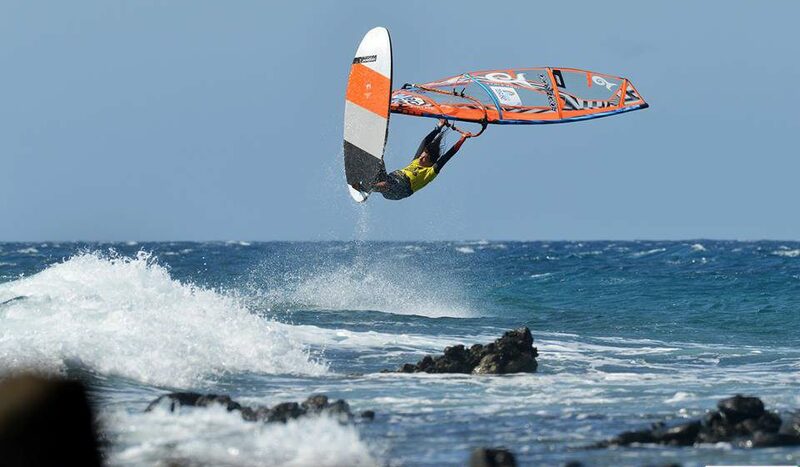 Antxon Otaegui, former European Champion and owner of the Pro Center Antxon Otaegui in Las Cucharas, is again responsible for what is known to be one of the best windsurfing events of the year: the EFPT Lanzarote. With outstanding conditions in 2015, 2016 and 2017 we are looking forwards to see what this Canary island will deliver in 2018! The season will be rounded off at the final international freestyle event of 2018: the DAM-X in Brouwersdam, Holland. The organisation stepped it up again this year with 10.000€ prize-money and 3.000€ prize-money for men and women respectively up for grabs. We are delighted to be able to once again finish off a long season at this fantastic event. We are looking forwards to an exciting tour and hope to see many old friends and new faces at the EFPT events 2018! For more information about the events, please head to the event section of the homepage.